MAGALANG, Pampanga—Blessed with a sunny yet cool day and aided by 15 aircraft manned by Filipino and foreign pilots, 39 special children and teens from Luzon learned and felt what it was like to be up in the sky while enjoying an aerial view of Mt. Arayat and Central Luzon’s verdant farms. as they reached for the Sky. When Nikko Tallada, Jeremy Lapeña, Carol Inere and other children with disabilities and ailments joined the “Reach for the Sky” event at the airfield of the Angeles City Flying Club (ACFC) here on Saturday, more than 50 photographers were on hand to capture their joy, excitement and fear. The children and teens rode in groups on three helicopters of the Philippine Air Force and the Philippine Navy or took turns riding with pilots on 12 two-seat light planes. They spent 10 to 20 minutes up in the air and were allowed to ride the planes and helicopters more than once. Tallada, who lost his right leg to bone cancer last August, looked tense when he took his seat on a light plane. “Oh, you’re a veteran of the Vietnam War,” Boy Guevarra said before his 16-year-old passenger, donning two dog tags on his neck, put on the audio system and handed his crutches to his mother. “I’m happy. The flight made me happy. I feel loved because they gave us this experience,” said Tallada, who wants to be a policeman. This feeling of being touched, said John Chua, founder of Photography With a Difference (PWD), was what his group’s project, “Reach for the Sky,” was all about. Chua, 63, has been doing advertising photography over the past 40 years. “One photographer can make a difference and many photographers can do a lot of difference,” Chua told the Inquirer. He was referring to his encounter in 2008 with Ian, a young man with autism. Instead of just helping the mother and Ian bond at Manila Zoo and giving her solace through photographs of her son, Chua taught Ian point-and-shoot photography. Tallada’s mother, Teresita, said the event also helped her son cope with the sadness of losing his leg. Jeremy Lapeña, 14, stricken with Down Syndrome, was both excited and afraid. But he never asked Jay Cook, a retired Australian bush pilot, to put the light sport aircraft down. The plane’s owner, Helmuth Cotter, gave the free flight because it was for a cause. “All this flying is putting a smile on the faces of the children,” Cotter said. “He overcame his fear and look at him, he’s ecstatic,” said Lapeña’s mother, Agnes. In fact, he also rode the Philippine Air Force chopper. The whole day affair saw Henry Munarriz, a 12-year-old boy with autism, helping paint a mural after the flight. Fun activities, games and picnics followed. From Ian in 2008 to a similar but small event, called “Dream Flight,” in 2010, the PWD advocacy for the well-being and acceptance of special children and youth has grown. 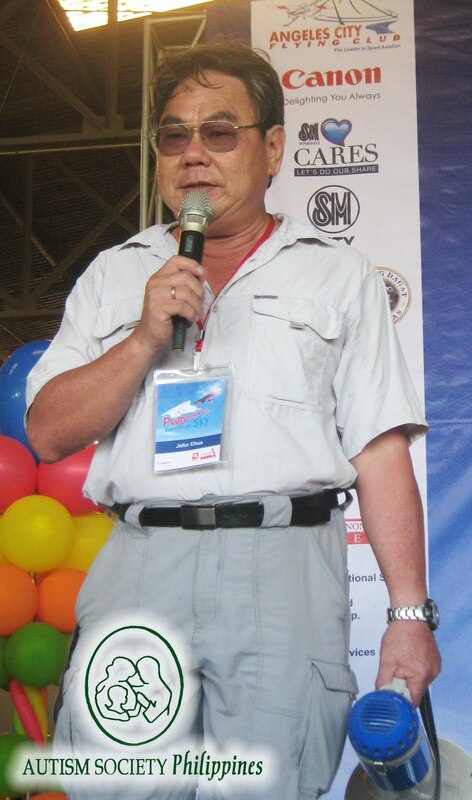 The event started with the support of the Philippine Navy and the Kythe Foundation last year. But this year’s event also drew support from Canon Marketing Philippines and SM Cares, the corporate social responsibility arm of SM Supermalls. Aside from Kythe Foundation, the beneficiary organizations now include the Philippine Society for Orphan Disorders Inc., Autism Society Philippines, Parent Council for the Welfare of Hearing Impaired Children Inc., Down Syndrome Association of the Philippines Inc., AD/HD Society of the Philippines, and Parent Advocates for Visually Impaired Children Inc.
Photographs taken from the event will be exhibited at SM malls, said Bien Mateo, SM Supermalls vice president for mall operations and program director for SM Cares program for persons with disabilities. “We want the exhibits to help change attitude toward PWDs and special kids and youth,” Mateo said. Chua said he was amazed by how he got organizations and people on the advocacy through the social networking site Facebook. He initiated similar events in Singapore and Indonesia last year and is set to do Reach for the Sky next month in the United States with Filipino photographers. Uploaded with Permission by Philippine Daily Inquirer, 39 Special Kids Reach for the Sky.